Shaken or stirred, vermouth is the drink to be seen with this season. When the latest Bond film, Spectre, hits screens on October 26, retailers should be armed and ready with all the ingredients for a great Martini. But it is not just Bond driving the demand for vermouth. Richard Ellis, spirits buyer for London’s Hedonism Wines, tells OLN: “We are seeing a new interest in vermouth. It is spreading into the off-trade in a smaller way from bars, and people are understanding a bit more about it – they understand how to use it at home themselves. Our vermouth range has doubled in the past six months. Marylebone’s Chiltern Firehouse is one of the London night spots that focuses on vermouth, and the drink features heavily in the cocktails of The Artesian, which has been named the World’s Best Bar for three years running by OLN’s sister title Drinks International. Soho Italian restaurant Mele e Pere makes its own vermouth, flavoured with botanicals such as gentian, hyssop, lemongrass and angelica, and serves it neat, as do Shoreditch’s Jago restaurant and Angela Hartnett’s Café Murano – which has a whole page in its bar list dedicated to its range of 10 vermouths. 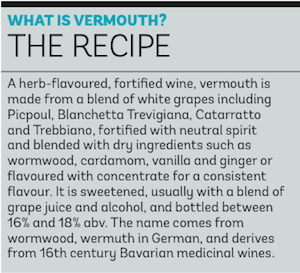 Thinking Drinkers Ben McFarland and Tom Sandham have also tipped vermouth for the top, recommending Italy’s Punt e Mes, German-made Belsazar Vermouth Red, Sacred Spiced English Vermouth and Cocchi Vermouth di Torino in a Telegraph column. The Drink Shop has seen a surge in vermouth sales. It has an extensive list of the wines, with classic brands including Cinzano, Martini, Noilly Prat, Lillet and Cocchi, as well as lesser-known names such as La Quintinye from Charentes in the south of France, Dolin from Chambéry, Vya from California’s Quady Winery, Mancino from Italy, and a Sussex-made vermouth from Blackdown Artisan Spirits. Managing director Tim Francis says: “There has been an upswing in sales. There is so much more interest generally in cocktail- making. People are upgrading to higher-end vermouth, things with more complex flavours. They are experimenting with new things at home and everybody wants to make the perfect Negroni. The Drink Shop saw a “whopping” boom in sales of Kina Lillet when Daniel Craig mentioned it in his recipe for the Vesper cocktail in his first Bond film, Casino Royale, in 2006 – and Francis says customers are still coming to the site to make that cocktail today. He keeps a close eye on blogs and social media for hints of what might feature in the new film, and has heard there will be “intriguing differences” in what Bond drinks and how he drinks it. Hedonism’s Ellis expects to see vermouth sales spike when Spectre comes out. He says: “Bond is known by so many people and has such a huge following it seems to be one of the few films that most people say they are going to see this year. Vermouth is not the only drink likely to benefit from the release of Spectre. 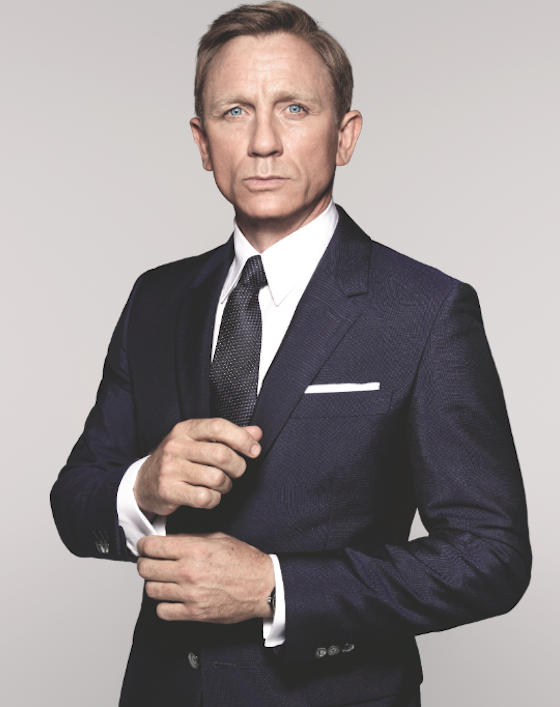 A recent study by The Grocer revealed that Daniel Craig is the “booziest Bond ever”, consuming 20 units of alcohol per film on average – a considerable increase on the 11-unit record formerly held by Sean Connery and Roger Moore. Heineken has continued its association with the franchise, sponsoring its seventh Bond film in a row and even getting Daniel Craig to star in an ad for the lager. Vodka and gin also look set to benefit. In Ian Fleming’s Bond novels and short stories, 007 orders 19 vodka and 16 gin Martinis, and in Spectre he is back on the vodka. Belvedere has signed up as the official vodka of the film, and has released a limited-edition bottle featuring Bond’s gun barrel. Meanwhile, the Gin Guild is holding a Martini masterclass ahead of the film, hosted by drink historians Anistatia Miller and Jared Brown of Mixellany, which will give bartenders and retailers the ammunition to tempt filmgoers to try the gin version of Bond’s favourite cocktail.